Over the last couple of days we seen a few bits of info regarding the upcoming Avatar project, some rumor and some concrete. Individually these things may seem like only minor tidbits, but put them all together and we are really starting to get some serious insight into what we may find within “Pandora: The Land of Avatar”. And let’s start with that name, shall we? In an interview published by slashfilm.com, James Cameron used the name “Pandora: The Land of Avatar” for the first time. All over the internet we are seeing articles now proclaiming this as the official title for the land, right from the man’s mouth. But let me sound this word of caution. Besides the standard “things can always change” stuff, the full quote from Cameron was “It’s going to be called, I believe, Pandora: The Land of Avatar.” And that sounds like a little less than one hundred percent confidence on his part. Could he not have this completely accurate? Of course, but let’s work with that name until we here otherwise. The animatronics for the Na’vi characters are gonna be fantastic. For example, their early animatronics would use 12 axis of motion and I think the most they’ve ever done was 32 axis recently. I think they’re up to 64 just in the face of the Na’vi characters. This sounds really exciting, but it also seems to give us even more of an idea as to why this will take so long to build. Now, anyone who listens to Radio Harambe will know I am the first one to point out how interminably long it seems to take WDI to build anything these days, but between engineering these AA’s, and the other things like floating mountains and bioluminescent scenery, maybe it’s time for me to cut them a little bit of a break. There is apparently ALOT of thought and technology being developed here. Finally, this photo started to appear in the Twitter world over the last day or so. It is by a photographer named Scott Keating who takes a lot of Disney photos, including some aerial shots. What you are looking at is the construction site for Pandora. What does this tell us? Not much, as you can probably tell they aren't much past the clearing phase. But one big thing it tells us is that this area is REALLY BIG! 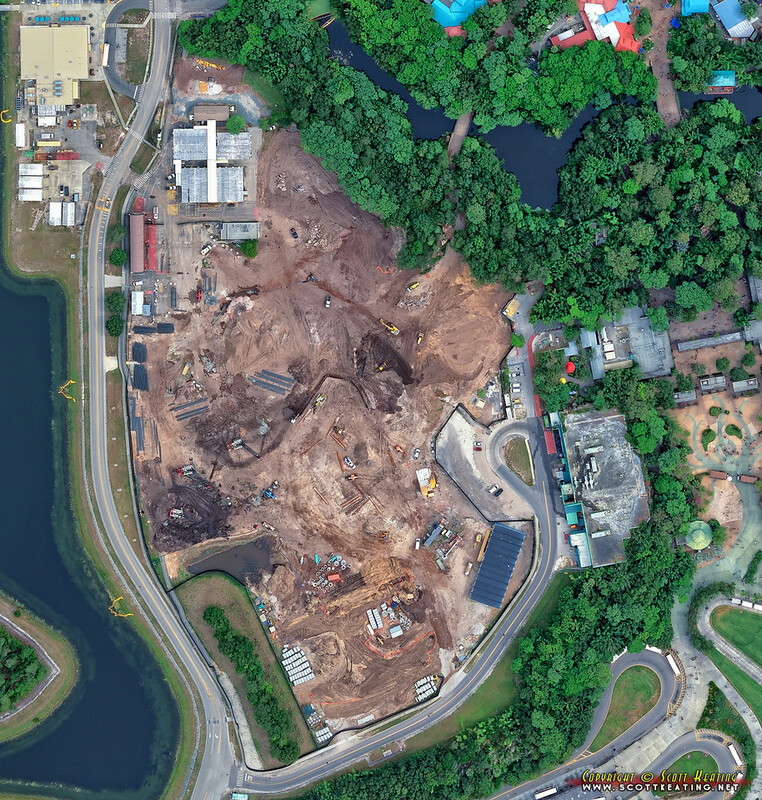 For a little scale, the building on the bottom left is the Rainforest Cafe, and you can also see some of the shops on Discovery Island and even a car or two. Much of this space will likely be offstage, but even with that in mind, it appears that Pandora will need a lot of space to fit everything in. Finally, we are starting to hear rumors that the planned boat ride for Avatar may be shelved, but that’s just conjecture right now. And considering within that same interview mentioned above Cameron said Pandora would include “several rides and a number of other attractions” we are going to wait a bit on this and see if it persists.